It represents a lustrous metal being in the unbound state. Zirconium without impurities is plastic and is hot and cold worked easily. One of the most valuable properties of zirconium is its high corrosion resistance in various environments. It is chemical element of Group IV of Mendeleev periodic system. It is named after the zircon mineral. It is a silvery-white solid refractory metal. It is highly chemically resistant (is covered with film of ZrO2 by exposure to the air). Industrial sources are: mineral zircon and baddeleyite. The content in the earth's crust is 0.025 % by weight. The nuclear arms race deployed in the 50's forced the Soviet Union to allocate its main resources for the urgent increase of their arsenals. However by June 1954 the USSR did manage to erect and launch the world's first nuclear power station, in Obninsk. The energy capacity of Obninsk Nuclear Power Station with the value of 30 thousand kilowatts of thermal power of the reactor only reached 5,000 kW. However, its operation allowed to solve not only many questions of power reactors reliability enhancement, but to outline the main directions in the further development of nuclear power industry in general as well. One of them is the increase of the nuclear power station efficiency. For this purpose it was decided to reduce the level of enrichment of uranium fuel up to 2-2.5%. In this case, the problem of selection of the material for fuel cladding (TVEL) and other elements of the reactor core became of particular importance, as stainless steel which was previously used for this purpose consumed too much neutrons which are so necessary in a nuclear reaction. Aluminum, manganese, beryllium, and zirconium have relatively low cross-section of neutrons absorption, but the conditions of their possible application were different. So, aluminum and magnesium would be acceptable as the main structural material of the reactor core only in case of the low temperature of the heat carrier. The use of beryllium for this purpose was deemed to be impractical due to lack of beryllium ore resources in the country and due to the number of features inherent to this metal, making its production too complicated and increasing the cost of the production. Due to its unique properties, i.e. neutron transparency (extremely low cross-section of absorption of neutrons), strength and high corrosion resistance, Zirconium is an irreplaceable construction material for atomic reactor power plants and nuclear facilities of the marine fleet. One of the main problems of zirconium application in nuclear power industry is refining of zirconium from hafnium impurity (even 1.5% presence of which twenty times increases the cross-section of zirconium neutron capture). In Russia the production of complete cycle, beginning from ore concentrate processing and ending with finished products from zirconium alloys, was founded at Chepetsky mechanical plant, Glazov, Udmurtia). Only a few countries in the world possess a complete cycle of production of zirconium products: the USA, Canada, France, Japan and Russia. CMP, JSC specialists together with scientists of scientific-research institutes conduct systematic upgrading of the production. They improve the processes of zirconium product manufacture, develop and introduce the new and more efficient technologies. This facilitates the cost reduction, products quality improvement, enhancing of nuclear fuel performance and improves nuclear stations' safety. The Plant produces zirconium ingots, crystal bar zirconium and tubes of various diameter. 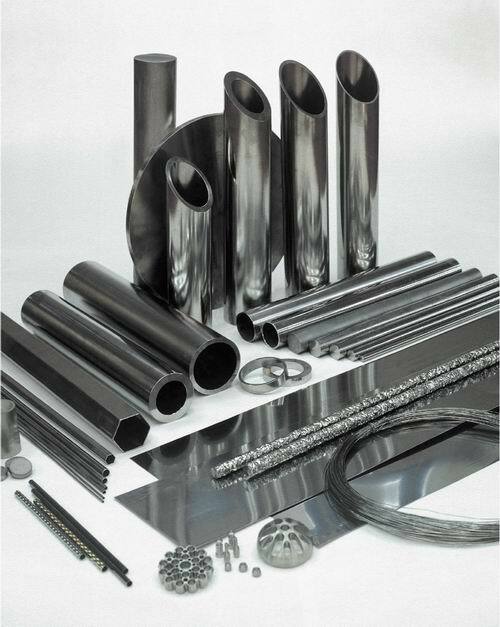 The list of products also includes the cladding tubes for fuel elements, wire, sheets, plugs and other components for fuel elements and fuel assemblies. In addition the Plant has developed the production of non-traditional products of zirconium, i.e. - bijouterie, table settings and dishes, souvenirs made of zirconium alloys, and zirconium dioxide-based ceramics. The operating Plant Quality System covers all production stages starting from marketing and launching product into manufacture and finishing with realization of final products. The modern methods of non-destructive, metallographic, mechanical and corrosion testing are widely used for maintaining the quality of the product. Among the consumers of plant zirconium products there are national nuclear, chemical and machine building enterprises, and also the companies of USA, Canada, Japan, China, European countries, Baltic countries and CIS countries.